The playgrounds are functioning in 16 rural schools, touching over 3000 students’ lives in Ghana. April 13, 2015—Since 2007, Empowered Playgrounds, Inc has installed 40 merry-go-rounds at schools all over Ghana, West Africa. “Our merry-go-rounds, powered by children at recess, generate renewable energy that charges lanterns that children use in their classrooms and homes to study at night.” http://www.empowerplaygrounds.org. The villages where the lanterns have been installed are mainly agricultural villages, where electricity has been mostly unavailable. 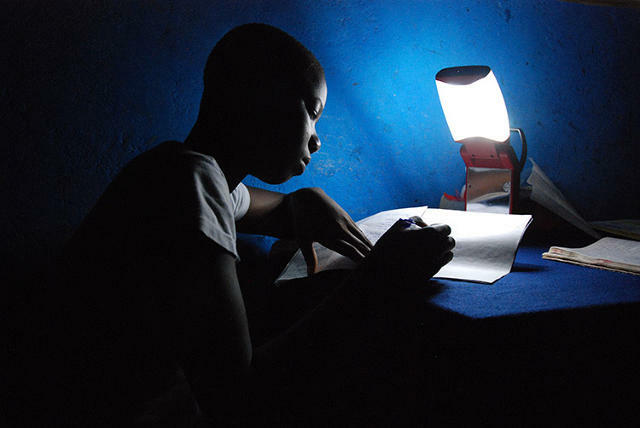 Children often go to the fields to work until dark, leaving no sunlight in which to study. With the playground-powered lanterns, these children can return to their homes to study. 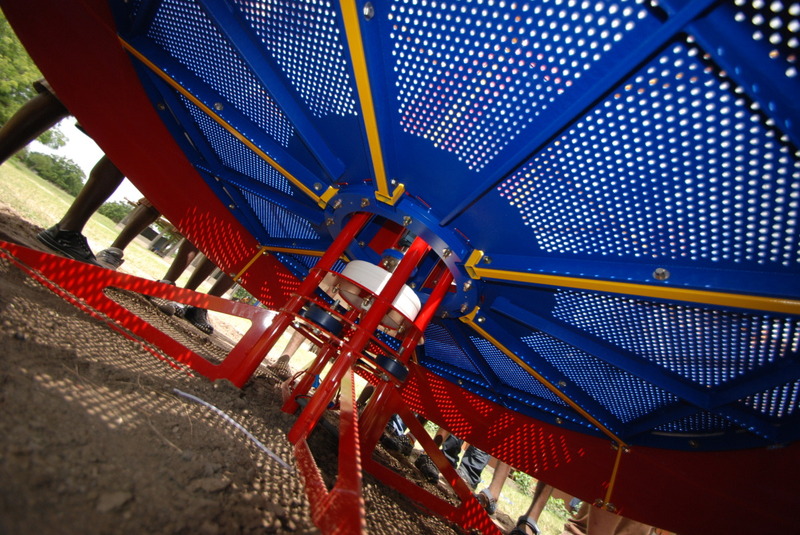 The system currently provides a power generating merry-go-round and glider swing, with other playground equipment currently being developed and tested. An eight to twelve year old child playing vigorously on the equipment can output about 100 watts of energy with the batteries holding up to 40 hours of charge. Play and Renewable Energy Combined! Empowered Playgrounds, based in the U.S. was founded by retired engineer, Ben Markham, who was living in Ghana, Africa. He observed the total darkness of rural villages and schools at night. He also noticed the lack of play equipment for the children. He asked himself, “What if a portion of the playful energy from these children could be harnessed? What if that energy could become light for their classrooms and homes?” With help from other engineers and materials available in Ghana, he created playground equipment which generates electricity by children playing. In 2008, the equipment was installed in several schools and ready for use. The materials used to create these projects are found locally or donated. Empowered Playground Diagram: How it works. In 2009, Energizer Batteries started developing, and donating smart LED lanterns, designed to light by playground power! The battery pack has a computer chip which regulates the charge to the storage battery. The lantern is the equivalent of a 25 watt light bulb and will last up to 5 years. The generation of electricity starts with a hub bearing attached to the deck of the merry-go-round. This is how the whole thing works. The generation of electricity starts with a hub bearing attached to the deck of the merry-go-round which is attached to a drive shaft connected to a gearbox. The high-speed output shaft then turns a permanent rare earth magnet windmill generator. The generated electricity is carried by underground wires to a power enclosure which manages the charging and discharging of the storage batteries, protecting it against draining. The electricity is converted into a direct current which charges the deep cycle battery.The efficiency of this generator is over 70%. A solar panel is also connected to the power enclosure to give power during times of school breaks. It was also discovered that not only could the playground equipment provide light but it could also be used as a lab for teaching mechanics, physics,and energy transfer. By using the playground equipment and energy converters the children can study how it provides electricity to the lantern. Empowered Playground, Inc has created a science kit and science lessons that correlate with the energy transfer by the playground equipment. Today, the playgrounds are functioning in 16 rural schools, touching over 3000 student’s lives in Ghana, with hopes of extending to other countries. In the coming years, Empowered Playground, Inc hopes to make improvements and extensions to their playground equipment and science curriculum, providing positive solutions in renewable energy! Could this also be used as a renewable and a science lab in developed countries? Categories: Building Green, Energy Programs, Renewable Resources, Solar | Tags: Africa, Empowered Playground, Inc, Renewable Resources, solar | Permalink.